Hyderabad, 7 Dec 2016: Infosys Foundation and The Akshaya Patra Foundation took the first step to build Telangana’s first High-Tech, state-of-the-art, Centralised Mega Kitchen in Khandi by laying its foundation stone on 7 December, 2016. Significantly, the Infosys Foundation has generously pledged to cover the entire construction costs of this advanced technology kitchen and has provided a grant of INR 18.03 Crore towards this objective. This High-Tech Mega Kitchen will provide mid-day meals to over 1,00,000 school children in Telangana region from the next academic year. The Bhoomi Puja was attended by Sri T. Harish Rao, Honourable minister for Irrigation, Marketing & Legislative Affairs of Telangana, Smt Sudha Murty, Chairperson, Infosys Foundation. The event was also graced by other eminent personalities that included Shri K. Prabhakar Reddy - Member of Parliament, Medak, Shri C. Prabhakar - MLA, Sangareddy, Smt Ranjeev Acharya, IAS - Principal Secretary - Education Department, Shri K. Manicka Raj, IAS - District Collector, Sangareddy; Shri Jagadeeshwar, IAS - Secretary of Government, Women, Children, Disabled & Senior Citizens Department, Smt Viziendira Boyi, IAS - Director, Women & Children Development Department, Smt Lanka Chandrakala - DEO, Sangareddy, Smt P. Umarani - Sarpanch, Sangareddy and Shri G Krishnan, IAS – Director School Education. The Bhoomi puja or the foundation stone laying ceremony was organised at the new kitchen site by Akshaya Patra to mark an auspicious start to the undertaking. Speaking on the occasion, Shri Satya Gaura Chandra Dasa, President, The Akshaya Patra Foundation, Telangana & AP said “We thank the Government of Telangana for giving us the opportunity to bring in this biggest social investment to Telangana. This will bring a meaningful change in the lives of school children. We are honoured to partner with the Infosys Foundation to build this Mega kitchen. We look forward to advance the vision of Bangaru Telangana by providing mid-day meals to all the Government school children across the districts in the state. I also thank all the dignitaries whose unwavering support has been pivotal to The Foundation’s success”. Shri T. Harish Rao, Honourable Minister for Irrigation, Marketing & Legislative Affairs of Telangana, conveyed that these partnerships are a commitment towards making of Golden Telangana a reality. He extended his support for nurturing the school feeding programme of Akshaya Patra in the state. He said that the programme has provided children with educational and health benefits which are important measures to ensure the golden future of Telangana. Addressing the occasion, Shri Madhu Pandit Dasa, Chairman, The Akshaya Patra Foundation, said “I wholeheartedly thank Smt Sudha Murty and the Infosys Foundation for being a great pillar of unflinching support to end class room hunger in India. I also wish to express my gratitude to the Government of Telangana and the Ministry of Human Resource Development, Government of India for their continued encouragement and support that will help the foundation progress towards its mission of feeding 5 million children everyday by 2025”. The Akshaya Patra Foundation is a not-for-profit organisation headquartered in Bengaluru, India. The organization strives to fight issues like hunger and malnutrition in India. By implementing the Mid-Day Meal Scheme in Government schools and Government aided schools, The Akshaya Patra Foundation aims not only to fight hunger but also to bring children to school. Since 2000, the organisation has worked towards reaching more children with wholesome food on every single school day. Akshaya Patra Foundation is continuously leveraging technology to cater to millions of children. Its state-of-the-art kitchens have become a subject of study and they attract curious visitors from around the world. In partnership with the Government of India and various State Governments and inestimable support from many philanthropic donors and well-wishers; Akshaya Patra has grown from humble beginnings serving just 1,500 school children across 5 schools. 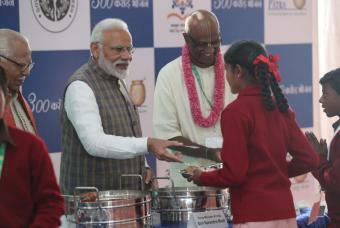 Today, Akshaya Patra Foundation is the world’s largest (not-for-profit run) mid-day meal programme serving wholesome food to over 1.6 million children from 13,526 schools across 11 states in India. Akshaya Patra currently feeds 62,000 children across 432 schools in Hyderabad and plans to expand its reach to many more beneficiaries in Telangana. Infosys is committed to the communities in which it operates. This has led to the creation of Infosys Foundation to support the underprivileged sections of society. A not-for-profit initiative aimed at fulfilling the social responsibility of Infosys Ltd, the Infosys Foundation creates opportunities and strives towards a more equitable society. Established in 1996, the Infosys Foundation supports programs in the areas of education, rural development, healthcare, arts and culture, and destitute care. Its mission is to work in remote regions of several states in India. The Infosys Foundation takes pride in working with all sections of society, selecting projects with infinite care, and working in areas that are traditionally overlooked by society at large. At the outset, the Infosys Foundation implemented programs in Karnataka, and subsequently extended its coverage to Andhra Pradesh, Arunachal Pradesh, Bihar, Delhi, Gujarat, Jammu & Kashmir, Kerala, Madhya Pradesh, Maharashtra, Orissa, Punjab, Rajasthan, Tamil Nadu, Uttarakhand and West Bengal.